Alix sent us this little ditty quite some time ago. She said “Check this out! Seems like it would be right up your alley”. Boy, does she know us! We love trying fun new cocktails; and with the addition of one of our favorite ingredients, (that’d be tomato), this one promised to be sublime. We absolutely could not wait to try it! And so we did. We rushed right out, gathered the necessary supplies, and got to mixin’. And….it was not good. Not that it was terrible, but just kind of blah. What gives? The idea is totally solid. The technique and execution is correct. How could this not be amazing? It had to be the ingredients. Even though we knew better, we tried to get by with out-of-season tomatoes in a pinch. And, we got burned. So, we waited. And waited. We waited until our own little tomatoes were at the peak of ripeness to try it again. Holy wow! What a difference a couple of weeks can make. With fresh ingredients that are in season, this cocktail wasn’t even in the same ball park as the first one. It was tangy, and perfectly sweet. 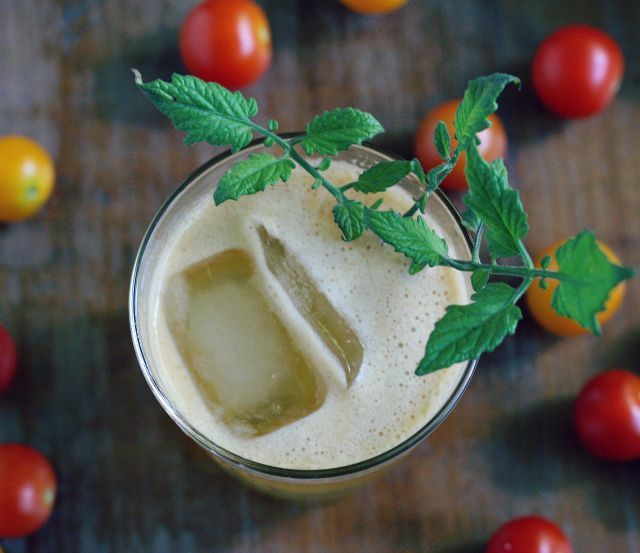 With a finish that you can only get from a perfectly ripe tomato, this was the cocktail we were hoping for. This one is definitely going to be our go to cocktail from now on. Well, at least for one month out of the year. Thanks for recipe, Alix! Muddle the tomatoes, salt and syrup together in a mixing glass. Add lemon juice and gin and shake well with ice. Strain into chilled cocktail glass and garnish with another tomato on rim (or some fresh tomato leaves) and enjoy! Want more Tasty Bites? Go here. If you are on Instagram, be sure to follow @birdandclever for more delicious photos. Tagged with sungold zinger cocktail, tomato cocktail, tomato martini. Tomato plant leaves have a mild toxicity. Though they’re a pretty garnish, I would not suggest using them with any frequency, particularly if one is serving this drink to guests.